The Lighjams music player is all you need to manage your music library, create your playlists and allow remote show control from Lightjams. Just to be clear, if you prefer, you can use any music player and music app with Lightjams (iTunes, WinAmp, Serato...). The Lightjams music player is just a simple app and adds synchronisation features. Download the	Lightjams Music Player (Windows 64-bit). It's free! Plug and play: Just start the music player and Lightjams will see it. No need to change any computer settings and use music loopback. 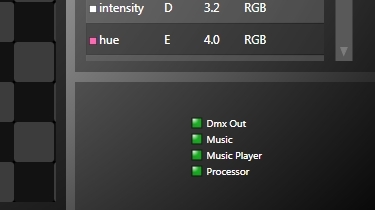 No delay at all: The music is analyzed a few seconds before playing, so the music info is sent to Lightjams at the same moment it is sent to the audio driver for playback. Very precise music spectrum: Since the music can be pre-analyzed instead of post-analyzed like in the case of live music, more music samples are used to do the analysis. No volume adjustment needed: The raw music data is used for the analysis, so no need to adjust the volume to get good results. Send info to Lightjams: More info about what's playing is accessible to Lightjams. You can now use the current playlist id, song id, playback time, BPM and more. Look for the new formulas in music.player.XYZ. Control the music player from Lightjams : You can start the music, select a song, change the volume... This way, you can completely control the music and light from Lightjams. Suitable for professional shows: Music is buffered to avoid playback interruptions under heavy CPU load. No bloat: The Lightjams music player is all about being great at playing music and doing it efficiently. Start the Lightjams music player application on the same computer running Lightjams (the lighting controller software). In Lightjams, you should see a green music player LED. The music spectrum is sent to Lightjams in real-time and you can see it as a standard sound card by going in the View/Configuration and music tab. You can trigger your light effects based on the current song playing and the playback time. Here's a music player project file showing a way to organize your show and how to sequence the effects for each song. You can control about every music playback feature from Lightjams. That means, you can use all the Lightjams inputs to control the music player. For example: You can start the show and select a song from your iPad.